When your children are constantly growing before your eyes, the need to go shopping for new clothes is the one item that may repeatedly end up on your list of things to do. If the idea of online shopping has you scratching your head and wondering how much extra the shipping would cost, don't worry - there are plenty of places that offer free shipping on children's clothing. For childrenswear that is preppy, fun and classic with loads of personality, the J. Crew brand offers Crewcuts, which offers endless options for just about every part of your child's lifestyle. Whether you want to add a special touch to your child's blazer or sweater with monogram or invest in a new coat for the season, Crewcuts offers great quality items. For newborns, the retailer sells items up to 24 months, and for boys and girls sizes 2-16. While the J. Crew website offers free shipping for orders of $150 or more, items from the Crewcuts collection always ship free, with no minimum amount. Zappos has millions of products from thousands of clothing and shoe brands, and the childrenswear selection is massive. Moms will find top brands such as Calvin Klein, Uggs, Lucky Brand and others. Infant through teen sizing is available in clothing. Shoe sizes include everything from newborn sizes to older children's and teen's sizes. Nervous about purchasing the wrong size? Don't worry, you can return and exchange for free and there is help at every turn while shopping on the website, thanks to the reviews and customer service. Do you love Nordstrom, but live too many miles away from the closest store? Shopping online will provide you with just as much of a variety and top-notch customer service. When shopping on the Nordstrom website, you will find children's clothing for a range of budgets in sizes including infant, 2T-6x , 7-16, and tween for girls -- and sizes 2T-7, 8-20 and tween for boys. You can expect modern clothing styles including athletic wear, pajamas, special occasion garments, and casual wear. Environmentally conscious moms will love the uncompromisingly high quality and simplistic organic design of the clothing from Shop Boy and Girl. Designed by Christine Chang, the clothing from the collection is available for babies, boys and girls. The aesthetic of the designs created for girls has a bit of European flair. For little boys, the mood is cool surfer or rad skateboarder. Sizes offered at this site range from 2-12 for both boys and girls. Whether you are a mom who is preparing your child for a weekend in nature's elements or gearing them up for the seasonal temperatures, L.L. Bean is an ideal clothing source to help get you prepared. The timeless, straighforward styles are durable and easy for kids to wear. Sizes run from XS to XL for both boys and girls. Mothers with discerning taste who prefer luxury for their children can appreciate the designer options available at Saks Fifth Avenue. Here, there is a variety of fashion-forward finds in sizes 0-24 for infants and toddlers, 2-16 for girls, and 2-20 for boys. Styles include outerwear, dresses, tops, pants, pajamas, and accessories. Looking for contemporary fashion items with personality for your children? Mini Ruby is an online store that provides stylish finds for infants and children between the sizes of 2-12. From outwear to special occasion wear, you will certainly spot some cool stylish separates and outfits. If you can't find what you need at a store that offers completely free shipping, you have other options to take advantage of. Many stores have certain restrictions such as free shipping when your spend a certain amount. This is a good option if you have a lot to buy, or other things to purchase along with children's clothing. Want to add a bit of European flair to your children's wardrobes? British clothing retailer Boden has extended its brand here in the United States. The clothing line boast lots of color and prints sure to bring life to any child's closet. Sizes range from newborn to 16 for both boys and girls. For those who have ordered over $49, the company provides free shipping and returns. 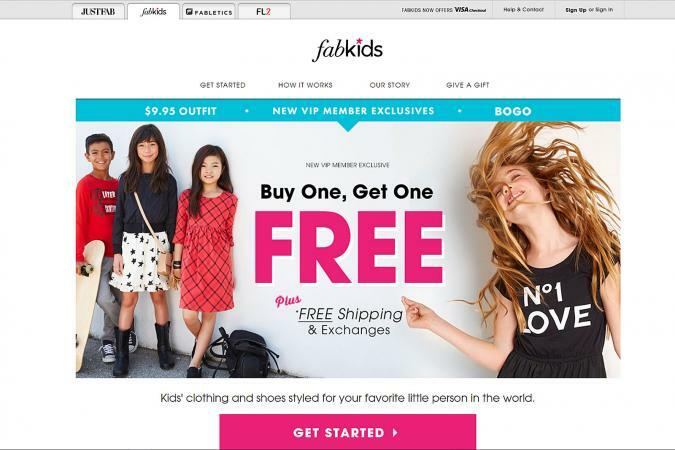 The subscription-based brand Fab Kids will provide curated selections and send to your inbox each month to keep you on top of your child's wardrobe needs. The retail brand sells cool casual clothing as well as dresses and sportswear. For items that you select, shipping is free when you purchase $49 worth of merchandise. Sizes available range from 2 to 16. For women who find themselves short on time with a limited budget, Burlington Coat Factory has a long list of brands for children. Whether you are shopping for their favorite character t-shirt, a pair of statement jeans, or outerwear, if your total order costs more than $50, you will get free shipping. Sizes available range from from baby to plus. Shopping for clothes online sans the shipping cost makes everyone feel great about sticking to their budget. If shopping on a retail site with a spending limit that determines whether you will be granted a shipping discount makes you frustrated, however, there are other solutions. Retailers such as Target, Walmart, Macy's, Nordstrom and others allow their customers to shop online and have the merchandise shipped to the store for pickup. Think of this method as one that saves you time from spending hours in the store. Websites such as Retail Me Not offer codes for coupons and deals that are not widely publicized. Using a code during checkout while shopping can tremendously reduce your total cost. In some cases, when new customers sign up for a retailer's website, a percentage off and/or free shipping is granted towards the first purchase. Those who find themselves shopping online frequently might want to consider signing up with a shopping membership platform such as Shop Runner or Free Shipping. Both platforms require a payment to join, however there are many other perks of membership that could save you money. Trial memberships are also provided to new users, which could be a great way to save money and test out the service while you shop for your child's new clothing. If you have been hesitant about shopping online in the past due to the worry of shipping costs, there are certainly ways to stay on budget. With the tips provided above, you will be able to score new clothes for your children, in the comfort of your own home without spending extra cash on shipping. Instead, that money can go on one more item or back into your wallet.